Trams draw their power from a single overhead wire at about 500 to 750 V. Trolleybuses draw from two overhead wires at a similar voltage, and at least one of the trolleybus wires must be insulated from tram wires. This is usually done by the trolleybus wires running continuously through the crossing, with the tram conductors a few centimetres lower. Close to the junction on each side, the tram wire turns into a solid bar running parallel to the trolleybus wires for about half a metre. Another bar similarly angled at its ends is hung between the trolleybus wires, electrically connected above to the tram wire. The tram’s pantograph bridges the gap between the different conductors, providing it with a continuous pickup. We must praise at this point to that wise man, who in 1949 insisted on the use of the more complicated Kummler & Matter trolleybus overhead wire system, than the usual rigid system common in Eastern-Europe. The roads of Budapest are often poor, especially the old cobblestone parts. The reason why the trolleybuses can still run here with normal speed without fear of dewiring is the soft K&M suspension of wires. Generally the tram-trolleybus crossings are insulated for the trolleybuses, meaning a long dead section, where the trolleybus must roll through. 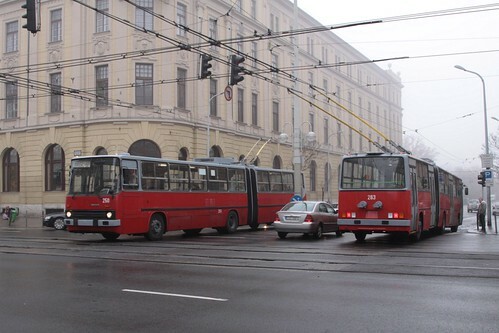 If for some reason here a trolleybus stops, only the passengers can push them off the crossing, as the trolleybuses do not have diesel or battery assistance. Presumably the insulated section for trolleybuses is the is the long stretch of wire hanging beneath the ‘normal’ contact wire. 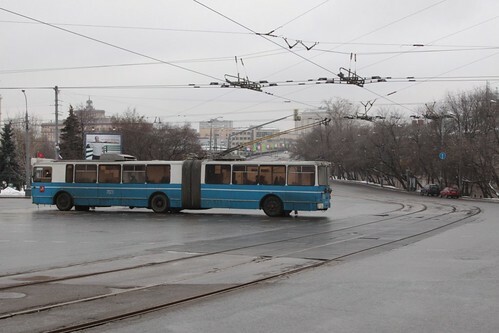 Moscow was the next place where I found a tram-trolleybus crossing. The need for a special design for the intersection of trolley lines is dictated by the fact that the trolleybus contact network consists of two wires that must be electrically insulated. Therefore trolleybus frogs are usually made ​​with an isolated middle section. 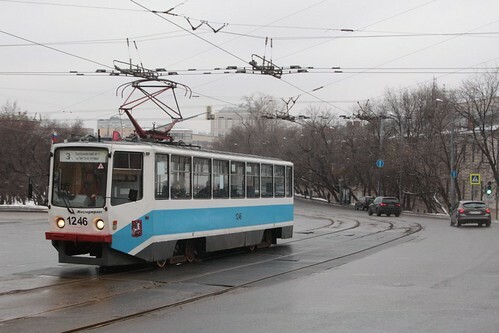 The tram conductor is usually located below the trolleybus wires. 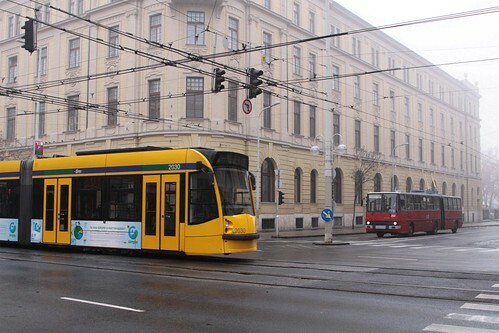 With this tram goes through the intersection without touching the pantograph to trolleybus wires. Crossings used in the former Soviet Union require speed reduction to 20 km/h when passing the intersection. International developments allow the passage through the intersection without slowing down. This crossing in Moscow shows the tram wire passing beneath the trolleybus wire, and the ‘rougher’ nature of the overhead for the crossing trolleybuses. Over in Innsbruck, Austria their trolleybus / tramway crossings are a little more complicated, with insulated troughs – Roger W. Haworth describe how they work. This entry was posted in Trams and tagged Budapest, Hungary, Moscow, pantographs, railway electrification, Russia, trolleybuses. Bookmark the permalink.